Are you looking for something healthy and nutritious but not willing to let go of flavor? Look no further. 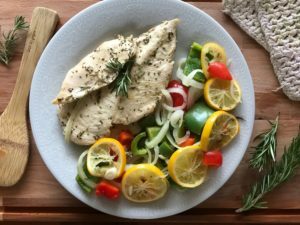 This 35-minute Rosemary and Thyme Chicken and Veggie Dinner is delicious and simple to make. Perfect for a make-ahead-meal that everyone will love. Set the oven to 425 Fahrenheit. Place the boneless chicken breast halves in a large bowl. Spray the chicken breast halves with non-stick cooking spray on each side. Add the salt, pepper, rosemary and thyme to the chicken and mix in the spices using your hands until it is evenly distributed. Coat the bottom of a large pan with cooking spray and place the chicken breast halves inside. Place two lemon slices over each chicken breast half. Place the chicken in the oven and cook for 15 minutes. Remove the chicken from the oven and immediately add the onion and bell peppers, and pour in the chicken broth. Cook for another 15 minutes or until the internal temperature of the chicken has reached above 160 degrees Fahrenheit. Remove from the oven. Serve and enjoy.